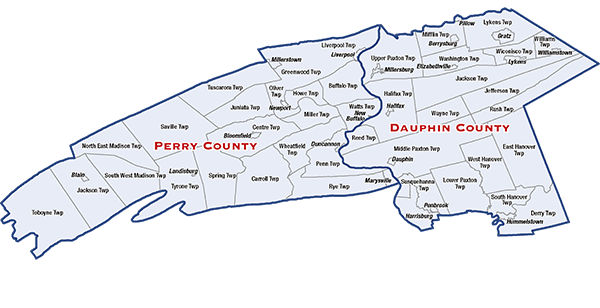 The 15th Senatorial District consists of part of Dauphin County and all of Perry County. Part of DAUPHIN County consisting of the CITY of Harrisburg and the TOWNSHIPS of Derry, East Hanover, Halifax, Jackson, Jefferson, Lower Paxton, Lykens, Middle Paxton, Mifflin, Reed, Rush, South Hanover, Susquehanna, Upper Paxton, Washington, Wayne, West Hanover, Wiconisco and Williams and the BOROUGHS of Berrysburg, Dauphin, Elizabethville, Gratz, Halifax, Hummelstown, Lykens, Millersburg, Penbrook, Pillow and Williamstown and All of PERRY County. Blain Senior Citizens Center, Inc.
Central Perry Community Senior Citizens Center, Inc.
Duncannon Senior Citizens Center, Inc.
Liverpool Senior Citizens Center, Inc.
Marysville Senior Citizens Center, Inc.
Millerstown Senior Cit. Center, Inc.